On July 29, 2013, the editorial board meeting of Frontiers of Computer Science (FCS in short) and “FCS Young AE Project”launching ceremony, hosted by the FCS editorial office, was held in the first lecture hall of new main building in Beihang University. Editor-in-Chief, Prof. Wei Li, new-term Executive Editors-in-Chief, Prof.Zhang Xiong and Prof. Zhi-Hua Zhou, members of Editorial Board, Profs. Songcan Chen, Dengguo Feng, Weiyi Meng, Xiaofeng Meng, Andrzej Proskurowski, Dongming Wang, Jie Tian, Jian Zhang, Baowen Xu, were all present at the conference, together with near a hundred enthusiastic FCS young scholars. Prof. Wei Li delivered a passionate opening speech, followed by an encouraging speech from Bingxiang Li, Deputy General Manager of Natural Science Academic Publishing Department, HEP and also Prof. Zhang Xiong, who expressed his hopes that Young AEs and FCS could make concerted efforts for common development. Prof. Wei Li issued the “Executive Editor-in-Chief” engagement letters to Prof. Zhang Xiong and Prof. Zhi-Hua Zhou, and “FCS Young AE” engagement letters to the Young AEs one by one. Wei Cheng, the managing editor, presented a general introduction of FCS. During the conference, the editorial board focused on discussing development planning of the next stage for FCS. In addition, the famous foreign expert in computer science, Prof. Proskurowski and Prof. Zhi-Hua Zhou delivered excellent tutorial lectures to the Young AEs. Prof. Proskurowski carefully lectured how to serve as AE and how to increase papers and journals’ quality by reviewing papers. Prof. Zhi-Hua Zhou explained in detail the reviewing process and working regulations for FCS Young AEs. Later on, focused on tutorial lectures, the Young AEs discussed in group on questions such as how to invite expert reviewers and how to promote the influence of FCS. Finally Prof. Zhang Xiong made an incisive conclusion of this conference. Initiated in February of 2007, FCS, an international English language academic journal, publishes latest research findings of computer science. Co-administrated by Higher Education Press and Beihang University, it has been indexed by SCI(E) and Ei. The call of “FCS Young AE Project” was started in 2012, and actively supported and responded by many distinguished Chinese universities as well as excellent young Chinese scholars. After careful screening, 112 young scholars have been selected, who will participate in reviewing papers and journal development after the launching ceremony. “Young AE Project” builds a platform for academic change among young scholars, benefits greatly the further development of FCS, which altogether make contribution to the field of computer science. Besides increasing the influence of FCS, the success of this conference calls on more excellent prominent young scholars to participate in the construction of FCS, who will join in the efforts of developing an internationally well-known academic journal of computer science. FCS welcomes more young scholars to join! Youth breeds innovation, especially in areas of Computer Science, where young scholars play a pioneering role in promoting academic progress and industrial development that has and will continue to change lives. At the age of 25, Kurt Gödel produced his incompleteness theorems; Alan Turing established computability theory and proposed the model of Turing machines when he was 24; Bill Gates founded Microsoft at 20; Steve Jobs founded Apple at 21; Google and Facebook were both set up by founders in their 20s. Similarly, preeminent young scholars and entrepreneurs, who help drive the academic and industrial progress of computer science in China, also emerge in large numbers at different times. 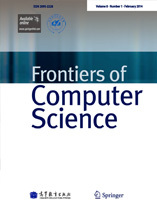 As an international English language academic journal, Frontiers of Computer Science (FCS) aims at providing the latest research findings to researchers of computer science. Young scholars’ active participation is the vitality of this journal. Therefore, we maintain close relations with them from the day this journal was initiated: young scholars are not only the readers and writers, but also the associate editors and reviewers of our journal. The 110 young scholars selected in this book will be appointed with tasks of reviewing papers for FCS. These well educated Young AEs with broad academic vision possess unique thinking ability and offer key academic evaluation. As active members in FCS, they, together with other young scholars, are both a dominant force and the future hope for research and development of Chinese computer science. Welcome more and more young scholars to join FCS Young AEs in the future. The goal of FCS is to build an effective and open platform for academic exchange and become an internationally recognized academic journal. Thus, young Chinese scholars are expected to acquaint themselves with the frontiers of computer science, abide by academic norms, maintain academic morality, develop qualities of being assiduous, optimistic, and persistent as well as work in an inclusive and down to earth style. There is an old saying in China that I wish to share with our young colleagues: “Study extensively, inquire accurately, reflect carefully, discriminate clearly, and practice earnestly” (from the Doctrine of the Mean - the Book of Rites). May this bring them mutual encouragement.